Fried chicken, the preparation of which can be traced back to a mid-18th century recipe from Great Britain, developed quite a bad reputation over the years, despite its popularity, reports of greasy, calorific and artery clogging fried chicken dishes, did nothing to change this view. Fast food chains such as KFC and Popeye’s made millions from this chicken product and its many spin off varieties in spite of its bad reputation and continue to do so to this today. There then arose what I call the “Fried Chicken Renaissance” where Southern Food concept restaurants and niche American Gastro Pubs started to serve a more quality product, with descriptions such as “My Grandmas Recipe “and “Butter Milk Brined”, sometimes paring the fried chicken with waffles and black pepper water melon. This conjures up a product steeped in rural tradition and Americana lore and by far outgrowing its humble beginnings. I know by now your taste buds are going mad, but that’s just the point, fried chicken seems to evoke this feeling in most of the population of the planet. So now comes the decision, you know you want fried chicken, who makes the best. Well, the result may surprise you! There are some great fried chicken dishes out there, in some cases made from closely guarded chef recipes and served in establishments as varied as food trucks to fine dining, and I applaud them all for helping to change our opinions and fall in love with fried chicken all over again. But for me in terms of Value, Quality and Convenience, Publix Fried Chicken is hard to beat (Yes I said Publix). For a couple of years, I thought I was on my own in this opinion but after newspapers, magazines and surveys regularly have Publix Fried Chicken in their “Top Ten” in the South, then I guess the cat is out of the bag. It even has its own Facebook page! What makes it so good? Well, apart from the convenience of being able to grab some to go along with your normal grocery shopping and the fact that you can chose your chicken pieces and not be left with a couple of inedible wings as you sometimes get in buckets of chicken from fast food chains, the cook on the chicken is superb. This freshly prepared chicken seems to hit all the senses and flavor tones, coated with flour batter flecked with ground black pepper and flavored salt, then fried to a deep golden crunchy brown with crisp crunch and an extremely low grease content, ready for you to pick up hot from the serving tray. Fantastic when served hot, but just as good cold after refrigeration, so superb for picnics, late night snacks etc. 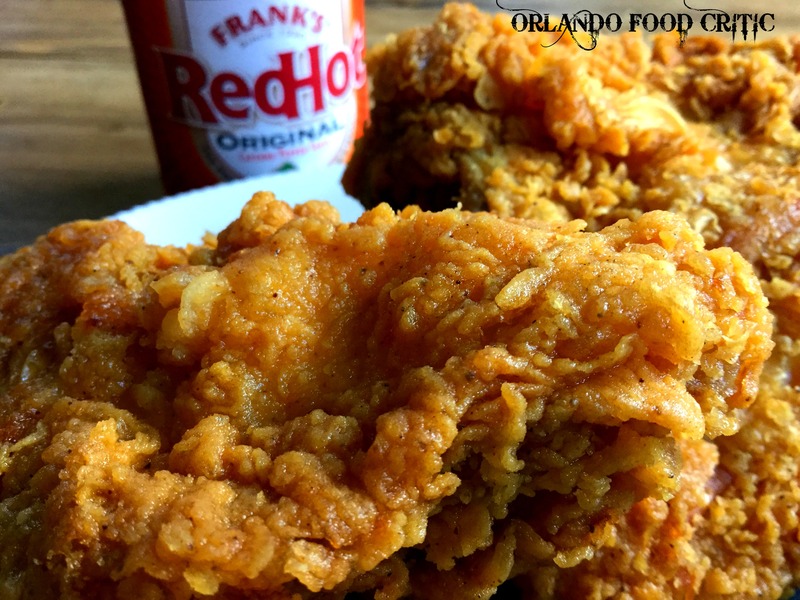 Add a splash of Franks Red Hot Original and take it to another level. All of this delivered at a price point that is hard to beat. Publix Fried Chicken easily stands up against the best in the south and in testament to its popularity are the lines that form by the Deli Counter during lunchtimes and after work. I am sure there are variations from store to store, but at my location, Publix Winter Park Village, I am and will continue to be, a committed Publix Fried Chicken devotee.